This recipe for Danish meatballs also known as Frikadeller is properly one of the most, if not the most, popular national dish in Denmark. For most of the Danes this is a dish they have on a regular basis and a dish that they have had their entire life. 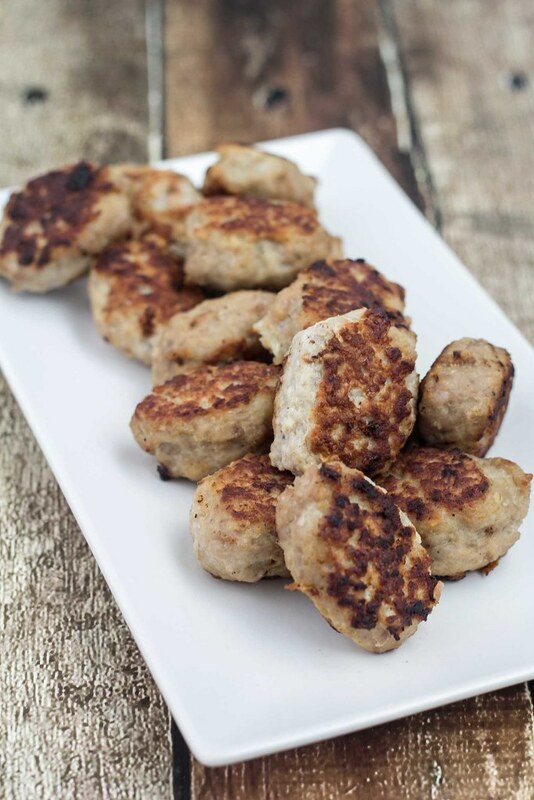 Frikadeller is super easy to make and they have a great taste. You simply just mix all the ingredients in a large bowl, mix well and fry the meatballs on a frying pan with oil – it is that simple. 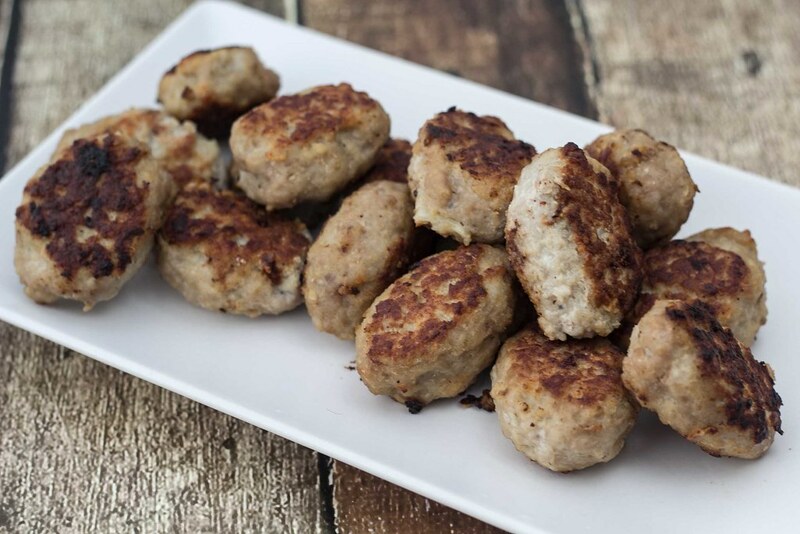 There are many different variants of Frikadeller, however the basic ingredients are always ground pork, onions, milk, eggs, flour and salt and pepper. I have always learned that the onions are the ‘secret ingredient’ in Frikadeller and that it is the onions that gives the characteristic taste to the meat. There are different opinions whether the onions should be chopped coarsely or finely, cut in large pieces or just blended. Personally I prefer the onions finely chopped or blended – this way I believe you get the most taste out of the onions. Another personal variation of Frikadeller is whether you want the meatballs large or small in size. Time wise it is faster to make few but large meatballs, however, we always makes many small meatballs this way we get more of the delicious crisp crust when frying them. The second very important ingredient in the meatballs is the salt. The salt is important because it enhances the taste which makes the Frikadeller even better. This recipe for Frikadeller is the one my parents used when I was a kid and it is the one I uses the day today. We can recommend serving these meatballs with some homemade freshly bread with sunflower seeds or some boiled potatoes. The meatballs are also perfect as topping on a slice of some healthy homemade bread or simply just as a snack in the afternoon. Step 1: Mix all the ingredients together in a large bowl using a spoon or hand mixer and place it in the fridge for about 30-45 minutes. Step 2: Heat up a frying pan with some butter or oil. Step 3: Use a spoon to form the meatballs. If you dip the spoon in a glass of water before you form a meatball it will be easier and the meat will not stick to the spoon. Fry the meatballs for about 5-10 minutes depending on the amount of heat you give them. It is best to flip over the meatball often – this will give then an even crust. Tip: Serve these meatballs with some boiled potatoes or as topping for some delicious Paleo bread. Jeg har lige fundet din side. Jeg har boet i Australien i over 53 år. I de første 25 år kunne jeg ikke forstå, hvorfor mine Frikadeller ikke havde den rigtige smag. En dag stod jeg hos slagteren og en kunde bad om et havl kilo Snine fars, også blev lunten tændt. Jeg havde brugt Okse fars, Derfor !!! Jeg har ikke prøvet din opskrift endnu, men den lyder godt. Tusind tak for alle opskrifterne. I am of Danish and Icelandic decent. This picture looks just like what I had growing up. This family recipe has been passed down for many generations.. I am going to make it for dinner tomorrow with my niece’s. 4 generations! !it’s that good. Hi Donna. Thanks a lot for your comment. It’s comments like yours that wanna make me continue sharing recipes on my blog. Hej. I used this recipe last night. They tasted amazing, and I don’t usually like meatballs. I’m going to Denmark next December, and I’m excited to see if I came close to making the real thing. :) Tak! Born in Canada from Danish parents. Making these a second time because they taste exactly like Mom used to make. Simple and authentic, love them. So my husband and I just made these meatballs and they are as good as it can get to the real ones. It was so delicious thank you for a great recipe. He is Danish and he loved it. I didn’t put the oats and i used breadcrumbs in the mixture, this will be my weekly recipe from now on. Hi Sabrina. You are very welcome :-) I’m happy that you like the recipe. Lovely recipe, but different from the meatballs my Danish in-laws made each Christmas. Theirs combined beef and pork, added allspice, and used only a small amount of grated onion. Probably closer to the Swedish kottbullar. Aunt Anna said that her mother sometimes put a peppercorn or an allspice kernel inside of the meatball. I make a version of hers, and have found that baking them for a short time in a very hot oven gets good results in less time.. This is the most amazing food blog! I thank you for producing all of these fabulous recipes. I came here to look for a “good” recipe for Frikadeller (we are having them for Christmas) and you produced the goods. And then I looked at all of your other recipes; so much to cook and eat and so little time left to do so. What a brilliant web site. On behalf of my partner (who is going to get VERY fat) and I, a very happy Christmas to you and tak for mad! Thank you for the great recipe. My father made this all the time as he was Danish, and we lived there as well. I never wrote down the recipe. But I remember we used pork and beef mixed together along with the rest. my question is what’s the best kind of onion to use. The pepper can make it too spicy. Going to try the allspice sometime. I can’t find any ableskiver pans here. Gotta try that for desert soon. I am an American of Danish + Swedish descent. My mother (93 yrs and still going) is Helen Johnson nee Larsen. Her mother was Astrid Jensen whose family was from Aarhus and her father was Hans Gustav Larsen who was from Møn. I mention these antecedents only so you may see that I have some Danish Cred! This is our family recipe for Frikadeller which I presume came from my mother’s grandmother Jensen who lived with her family when my mother was young. ½ – 1 cup Milk, ¼ Tsp nutmeg, ¼ Tsp Cloves, ½ Tsp Ginger. PREPARATION: Mix, form Patties, fry in 4 Tbsp butter, remove from pan and make a pan sauce with flour and beef stock. Return meatballs to pan and reheat with the sauce. Serve with boiled potatoes and beets. Hi Gus. Thanks for your recipe. It looks great. I see a few ingredients (nutmeg, cloves, ginger) that I have not tried before in Frikadeller. The next time I make some I will try your family recipe :-) It sounds delicious. I think you will enjoy the recipe! BTW, I also have made these into small 1.5 inch meatballs and served them as an appetizer at a party! There are never any left over!